Samsung has just officially announced it's newest fitness devices, the Gear Fit 2 band and the Gear IconX earbuds. The announcement confirms the rumours of a dedicated GPS chip in the Gear Fit 2 which ties in with the heart rate sensor gor effective tracking of workouts. The Gear IconX wireless earbuds also function as a fitness tracker and syncs with the S Health app via Bluetooth technology. There's no word yet about the pricing of either these two devices yet, but one wouldn't have to wait for too long as those details would be revealed when the Gear Fit 2 is launched on the 10th June with the Gear IconX launching a month later. 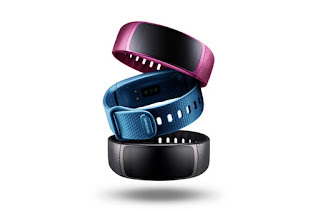 London, 2 June, 2016 – Samsung Electronics continues its expansion in the fitness wearable market today with the global unveiling of the Gear Fit2 and the Gear IconX. Each product is designed with users' fitness needs in mind, and includes features such as precise tracking technology and a standalone music player to provide people with the best possible fitness experience. The Gear Fit2 features an embedded GPS and a heart rate monitor (HRM) that offer accurate and robust fitness tracking and measurement, while providing instant feedback on the user's workout. The Gear IconX are truly cord-free earbuds that can track fitness information and provide runners with feedback on their performance. Both the Gear Fit2 and Gear IconX are designed to complement users' various fitness levels, whether they are training for a marathon or taking a daily stroll through the park. "Samsung has pioneered and led the wearables category over the last few years, bringing exciting new innovations into the market. The Gear Fit2 and Gear IconX are designed to help those striving to live more fit and active lives, offering features to enhance existing exercise routines as well as a standalone music player to keep users motivated. These new additions to Samsung's portfolio allow fitness fans and beginners alike to get more out of their fitness experience," said Conor Pierce, UK Vice President, IT & Mobile. Features an ergonomic, sleek and slim design for comfortable everyday use. Provides a Super AMOLED curved display with a high-resolution colour touchscreen for easy fitness monitoring, or checking and responding to text message notifications. With the Auto Activity Tracking feature, users won't have to manually activate the sports band - whether running, walking, cycling, or using a rowing machine. Enables easy transfer of fitness data between S Health and other select fitness applications, and provides 'Step Challenges,' for 1:1 competitions with your friends. Provides a lightweight, secure and comfortable fit with three different sizes of eartips and wingtips, and can be activated by simply placing the earbuds in the user's ears. Enables tracking of fitness data such as distance, speed, duration, heart rate and calories burned, and easily syncs with S Health. Includes a Voice Guide feature that provides instant voice feedback on the user's workout progress and provides a standalone music listening experience. With Bluetooth capability and an internal storage that can play up to 1,000 MP3s, users can simply tap or swipe the earbuds to easily control the music. The Gear Fit2 will be available from the 10th June 2016 and the Gear IconX will be available from July 2016. For more product information, please visit www.samsungmobilepress.com or http://news.samsung.com/galaxy.